Water Explorer Water Explorer - Our wall garden is growing! Well done Obed Tech on making such waves in such a short time. What a Terrific Team of the month for April ! Our wall garden is growing! We are building a greenwall! 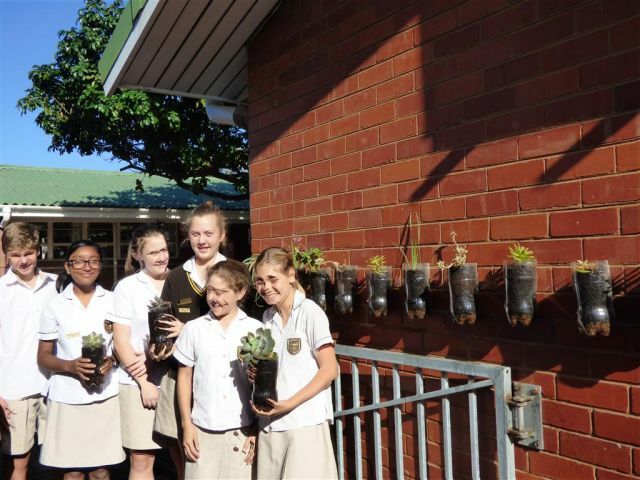 The grade 7's have taken on the task of improving the beauty of our school by adding to our eco-gardens, indigenous and roof gardens, by covering one of our brickwalls with indigenous plants. Using one litre coke bottles filled with soil and attatched to the walls they are in the process of making a lovely green wall. This will work with the roof gardens as a highway for noo-noos to negotiate our busy school.